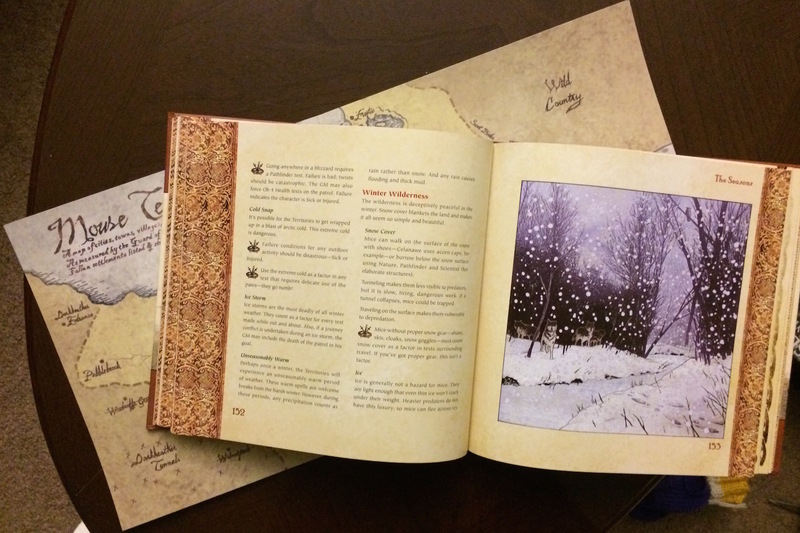 Cynthia: There’s something extra lovely about roleplaying games in the winter. Where I live in Minnesota, going outside can often be quite deadly, so I prefer to huddle around a table with friends and food and drink. The problem is, being trapped indoors makes me crave adventure. I want to slay monsters, battle evil, brave the ice and cold on a magnificent quest deep into forests and mountains – though I’m not actually going to go outside, of course, that would be insane. The point is, a good RPG lets me have it both ways: grand adventures and the cozy modern comforts of heating, lighting, warm beverages, and pizza delivery. And we all like having it both ways, right? …Right? Anyway, there is one RPG that this winter has been mollifying my seasonal adventure disorder and warming my heart just like a good cup of hot chocolate with whiskey in it warms your body. That game, my dear readers, is Mouse Guard. So grab your weapons, fluff up your fur, tweak your whiskers, and tap into your anxieties about owls, weasels, and raccoons. You’re about to undertake great and perilous deeds for the sake of all mousekind. 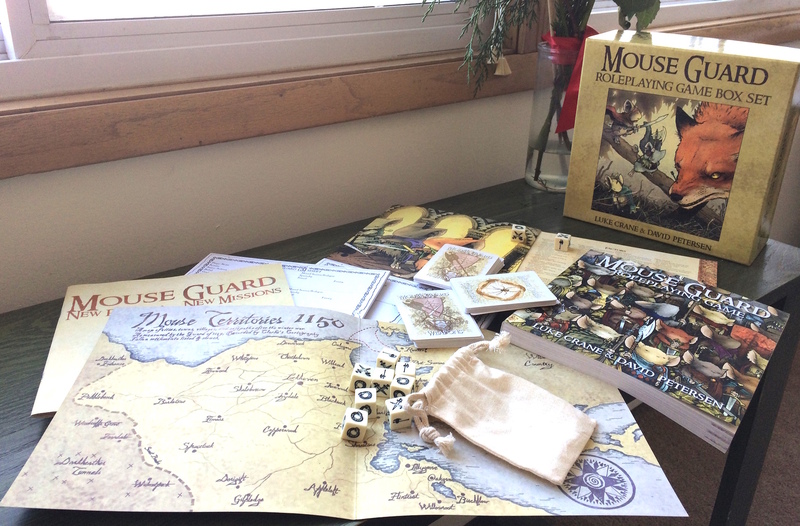 As some of you probably know and/or suspect, the Mouse Guard RPG is based on the Mouse Guard comic books by David Petersen – he co-authored the game. You don’t need to know the comics to play; you simply need to be able to imagine life as an anthropomorphised mouse. 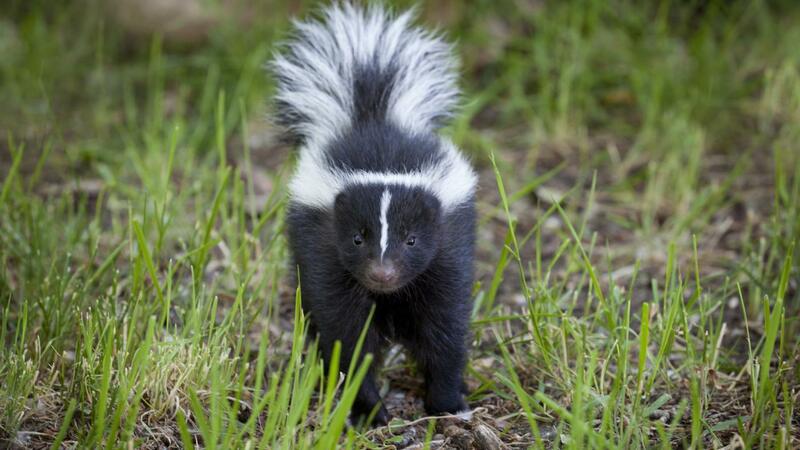 Imagine how monstrous a raccoon must be when frogs are twice your size. Imagine hiding under a maple leaf. Imagine two inches of snow covering your furry little body. Imagine the natural world rendered bigger, more wondrous, more dangerous. 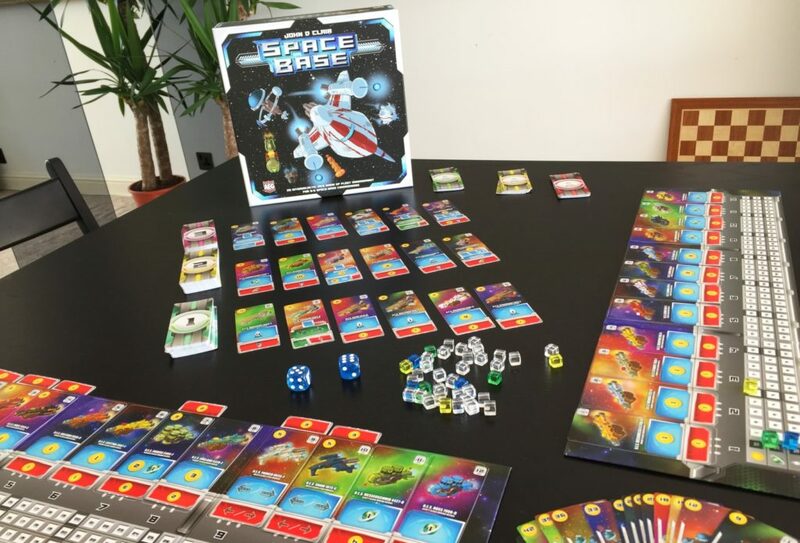 This game casts you a small rodent, surrounded by ferocious predators and all of nature’s perils and therefore creates boundless opportunities for heroism and triumph against the odds. When my character killed a kestrel I felt tremendously, absurdly, victorious. Real-life, adrenaline-rush, foolish-grin victorious. And then my character plucked a feather from the dead bird as a trophy, although that feather would probably be longer than his entire body, tail not included. Nature and predators aren’t your only problems. Mouse Guard situates you in an advanced society of science, conspiracies, bureaucracy, and crime. 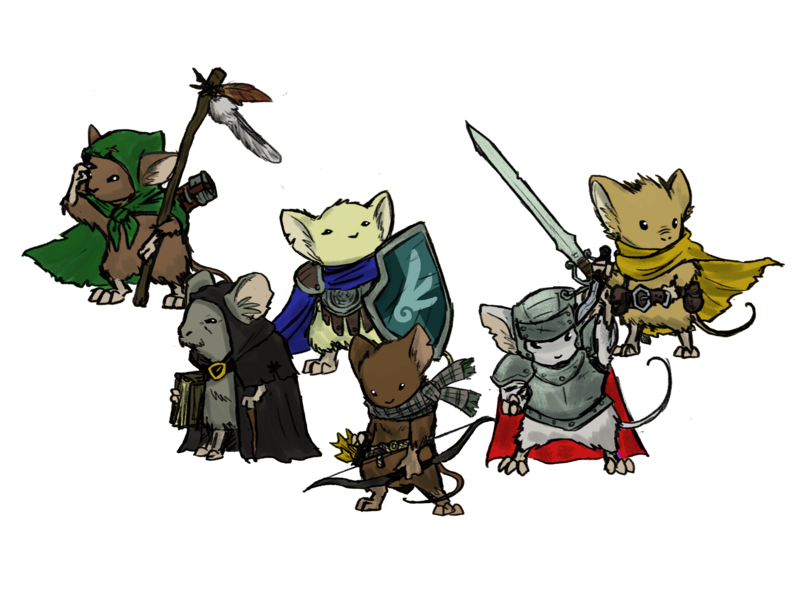 This mouse-human mixture lets Mouse Guard embrace a lot of now-classic RPG tropes: the mysterious stranger in the tavern, the small town needing to be saved, the climactic battle against a gigantic foe. Only except instead of a dragon, it’s a wolf or a bear. (Cats, mercifully, aren’t around). In one campaign we sailed with pirates, explored an underground labyrinth of tunnels created by weasels, and confronted a mad scientist who was poisoning my character’s hometown. 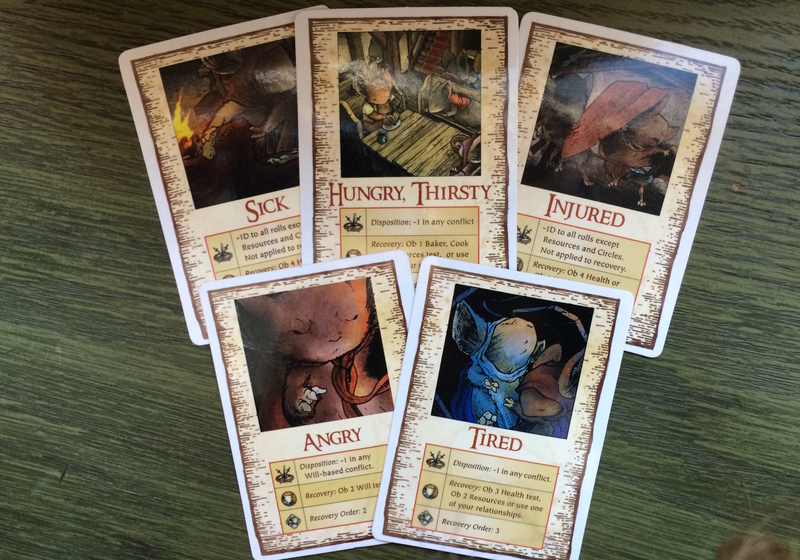 The whimsical character options of Mouse Guard still make me smile when I read them. Yes, there’s fighters, healers, and scouts, but also apiarists, weather watchers, boatcrafters, brewers, and loremice. You don’t just choose one, either: the format of character creation helps you make a very multifaceted mouse. 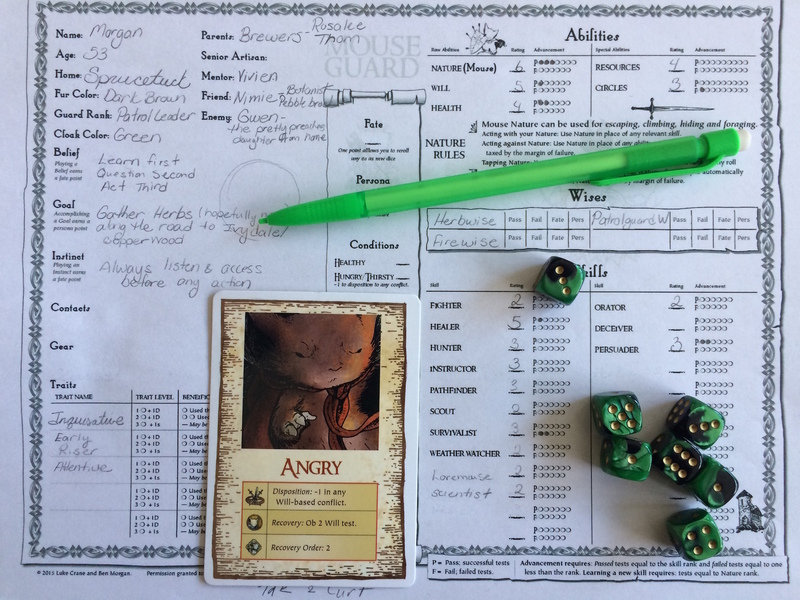 In my first campaign I played a tough, shore-wise teenaged fighter mouse who meant well but had some serious attitude problems. You could be a stubborn ice-wise cartographer who has a prehensile tail but no sense of direction, or a manipulative, rebellion-wise insectrist with deep ears that let you hear even the faintest sounds. Characters drawn by Jon Ying (yes, the Imperial Assault and DOOM Jon Ying) from the Mouse Guard campaign he ran. My mouse is the frowny one carrying a bow and arrow. You can see more of his artwork here. I should warn you, though, that one aspect of character is rigidly fixed. You must play a guardmose, sworn “to protect the sanctity of our species, the freedom of our kin, and the honor of our ancestors,” and never put yourself before others. Your guardmouse may be jaded, suspicious, or scarred, but still trying to be a force for good. If the option to play an evil character is something you really need (and some people do, and that’s fine), Mouse Guard is not for you. Personally, I love this emphasis on good, old-fashioned, honor and heroism. And teamwork. So much teamwork. In no other RPG have I seen so many help dice passed around the table. Mouse Guard‘s sincere feel-goodness is infectious. I leave gaming sessions full of oxytocin and positivity, full of warmth for the friends I played with, and honestly feeling that if we all work together, we can accomplish anything, however cliché that sounds. Before you leap up, and brandish an imaginary rapier in the air, however, do let me tell you about the mechanics. Mouse Guard uses a variant of the fairly simple Burning Wheel system. 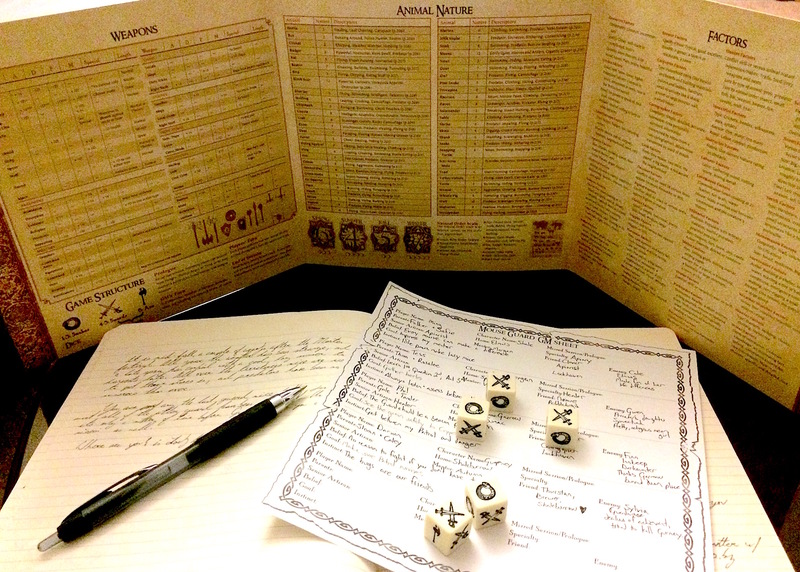 In a skill test, you roll a number of d6 equal to your skill rating. 4s, 5s, and 6s are successes (excellent odds!). You advance skills by succeeding and failing at them. The lower your skill rating, the less work needed to improve it – if you’ve never cooked before, it doesn’t take much to learn how to cook better. You’re advancing from nuking your dinner to making a grilled cheese sandwich (which admittedly I have never done). Conversely, you need lots of successes and failures to improve a skill you’re really good at. If you’re the Gordon Ramsey of mice, you’ll have to cook a lot of meals before you can reach the next level. See? It’s stubbornly not doing what you want. Mouse Guard does have one less-than-elegant aspect: as you may have guessed, it’s the conflict system. In a conflict, you must choose among four actions: Attack, Feint, Defend, Maneuver. 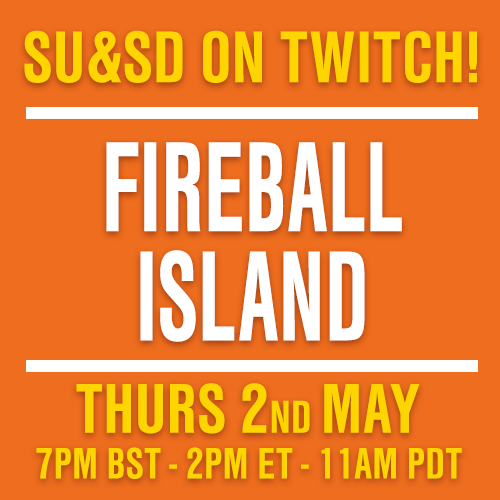 Each round, the GM and three players choose actions and quasi-simultaneously reveal them, one player at a time. So you might choose Attack while the GM chooses Feint. Then you consult a 4×4 table that explains the results of your choices, and whether or not you’ll even get to perform your chosen action. That’s the distilled version. Then the rules mandate using this three-turn four-action system for arguments, negotiations, speeches, long journeys, and chases. To me, that seems likely to seriously slow down gameplay, so I use the format only for physical battles. Its not clear to me why I shouldn’t simply use a skill test in the other cases. Why go through extra loops of charts and translations? So there’s the rub. But with that rub, I wholeheartedly recommend Mouse Guard. Less experienced players will have less trouble learning Mouse Guard than Dungeons and Dragons, and less experienced GMs will be shocked at how easy the game is to run, as I was. And what a world it gives you to scurry around in! Dramatic weather, terrifying animal adversaries, complex intermouse politics, fanciful locations… there are more charming things in Mouse Guard than you, my readers, have dreamt of in your philosophies. Finally, I’ll offer you this bit of buying advice. 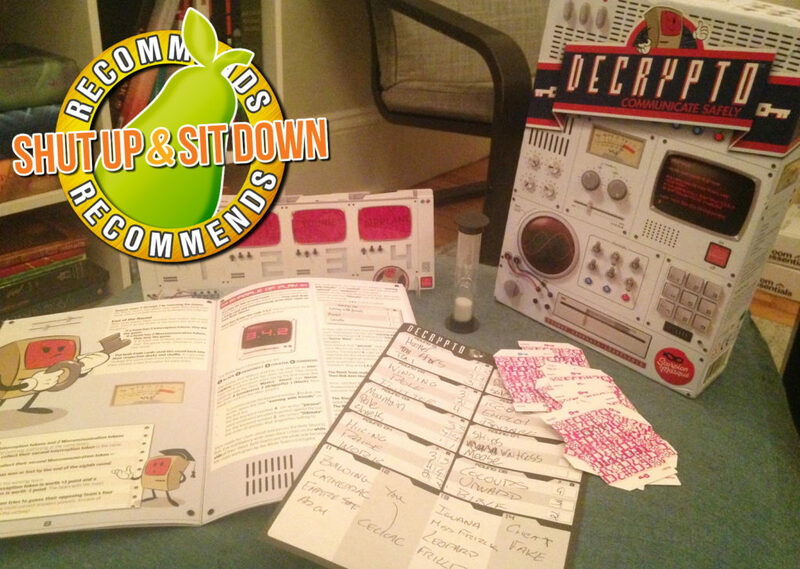 The Core Rulebook is fine. It’s hardcover, beautifully illustrated… perfectly covetable. But the boxed set is such a better deal. You know those four actions and related tables I mentioned? 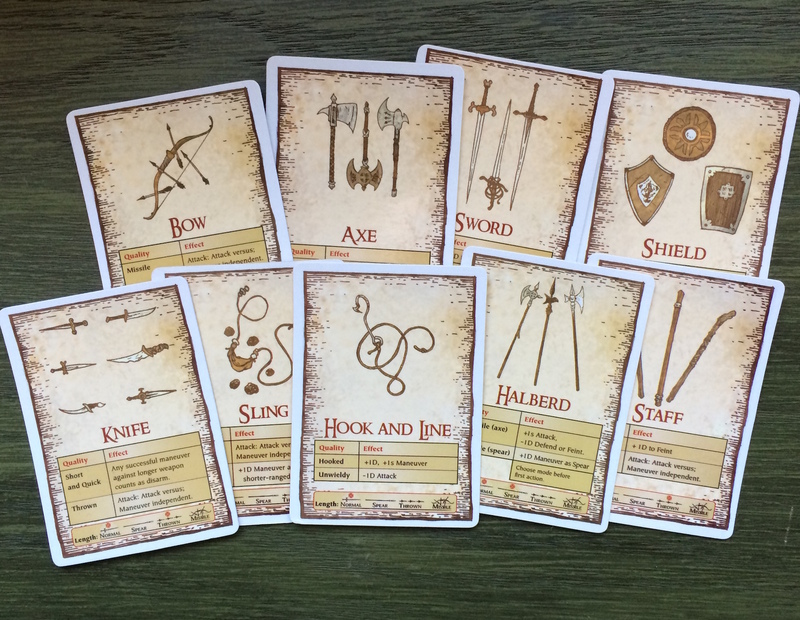 The boxed set includes these massively convenient cards for them, and for weapons, and for conditions like “Tired” and “Injured” and “Angry.” Sure, the map, pad of character sheets, GM information sheets, custom dice, and additional missions are great. 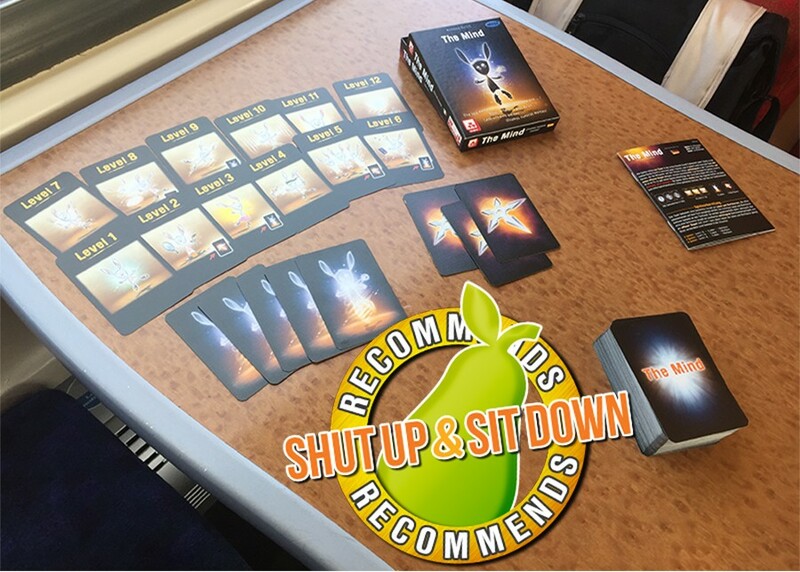 But those action cards are absolutely indispensable and I can’t imagine running the game without them. There you have it. The sidewalks outside my apartment have transformed into skull-cracking sheets of black ice, it’s 22º Fahrenheit outside right now but it apparently feels like only 8º, and more snow is on the way this weekend. Luckily, I’ve got plenty of food on hand and am playing Mouse Guard with a few friends on Monday. I suggest you do the same. After all, ’tis the season for showing that even the smallest creatures can do great things, for defeating the odds and saving the world – and doing it all in the comfortable interior of a warm home.